This 2 CD set re-cycles five striking masses by five very different Flemish composers. The time-span covers a century from 1475 (for Ockeghem’s Missa Au travail suis) to 1575 (for Lassus’ Missa Osculetur me). As those one hundred eyars unfolded so the sense of what a mass was developed also. In the first of these Ockeghem uses just four voices and is not far from Josquin for whom the four-voiced mass was perfect chamber music. The next in line, Isaac, uses six voices, then Brumel an amazing twelve, de Rore deploys seven voices and finally Lassus contributes a double choir mass (two choirs each of eight voices) used in the late renaissance poly-choral manner. The recordings here were made over an eight year period, all at the Church of St. Peter and St. Paul, Salle, so that there is a consistency of sound quality. All have been issued before in single composer discs. I am not sure whether it is helpful to lump all five together under the Flemish category as the composers’ backgrounds are so different. But it does provide a nice excuse to assemble some lovely recordings of delicious music. That said, the composers are all linked by a commonality of technique, even if the results differ remarkably. All are based on pre-existing material with much contrapuntal ingenuity creating a melodic mosaic. The casts for these recordings are in effect a roll-call of fine and distinguished singers. They include Tessa Bonner, Charles Daniels, Sally Dunkley, Robert Harre-Jones, Mark Padmore, Deborah Roberts and Ashley Stafford. 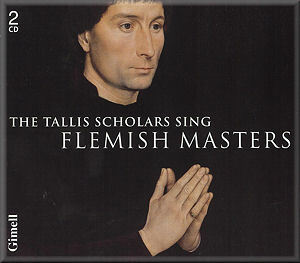 I must confess that, in the past, I have found the Tallis Scholars’ approach to music of this period to be rather too smooth and over modulated. I have usually preferred a more muscular approach. I seem to have mellowed, as I found the Tallis Scholars’ style entirely apposite to the music. Ockeghem’s Missa Au travail suis is based on a secular tune, either a chanson by Ockeghem himself or another unknown composer. Ockeghem only quotes the tenor part from the chanson. Ockeghem keeps his four voices to within quite a narrow compass so that the result is a Mass full of low, dark textures. The Tallis Scholars give it a rather lovely chocolaty texture. They also relish the moments when Ockeghem thins things out, leaving just a pair of voices. By contrast, Isaac’s Missa De Apostolis displays rich textures and soaring lines. It unfolds in a leisurely fashion; Isaac misses out the Credo, whereas Ockeghem includes it. Isaac still manages to make his mass last eight minutes longer than Ockeghem’s example. Isaac sets the text alternim, alternating plainchant with polyphony. The contrast helps to emphasise the richness of the six-part writing. It is based on plainchant for the Feast of the Apostles and was presumably written for the court in Vienna where Isaac was employed; in Vienna it was customary not to include the Credo as part of the Ordinary. Cipriano de Rore’s Missa Praeter rerum seriem seems to date from the period 1547/48 when de Rore was employed by Duke Ercole II d’Este of Ferrara. De Rore was an older contemporary of Lassus and wrote the mass just ten or twenty years before Lassus’s Missa Osculetur me. Despite this, de Rore’s writing is firmly in the Flemish school - worlds away from Venetian polychoral writing. It is based on a Josquin motet; de Rore also repeatedly uses the song’s alto part as a cantus firmus, setting as the text Duke Ercole’s name. The textures are rich and dark, enlivened by some nice cross rhythms. Brumel’s astonishing Missa Et ecce terrae motus dates from before 1520, when no-one had written a 12 part mass. He became deservedly famous for this piece in the 16th century. The manuscript source for the mass was copied for a 1570s performance at the Bavarian Court in which Lassus sang Tenor 2 and the top three parts were taken by boys. Parts of the Agnus Dei have rotted away so that any completion must be conjectural. The part allocation is remarkable. Technically there are three soprano parts, three alto parts, three tenor parts and three bass parts. Only one alto part is really an alto part. Brumel uses the other two altos and the three tenors to cover the same tessitura, writing far-reaching parts so that alto 2 has a range of over two octaves. In the twelve voiced parts, Brumel runs a series of canonic textures over an unhurried cantus firmus - based on the Easter antiphon Et Ecce terrae motus. The result is harmonically slow-moving and almost unadventurous, but in terms of texture and use of canonic motifs it is dazzling - think Josquin arranged by John Adams perhaps. This performance from the Tallis Scholars manages to bring admirable clarity to the textures, when it could easily be a muddy mess. Generally the cantus firmus lines are set nicely, being highlighted against the faster-moving canonic textures. That said, occasionally an individual voice gets a little too much prominence. As ever Peter Phillips directs these performances with clarity, precision and a feel for a nicely modulated line. A great deal of scholarship has gone into producing the music on the disc, but when you listen you forget scholarship and simply lie back and enjoy some fabulous music, beautifully and intelligently sung.